This won’t be a page about how to keep Monarch Butterflies as pets, but about seeing Monarch butterflies in nature. What is a Monarch Butterfly? 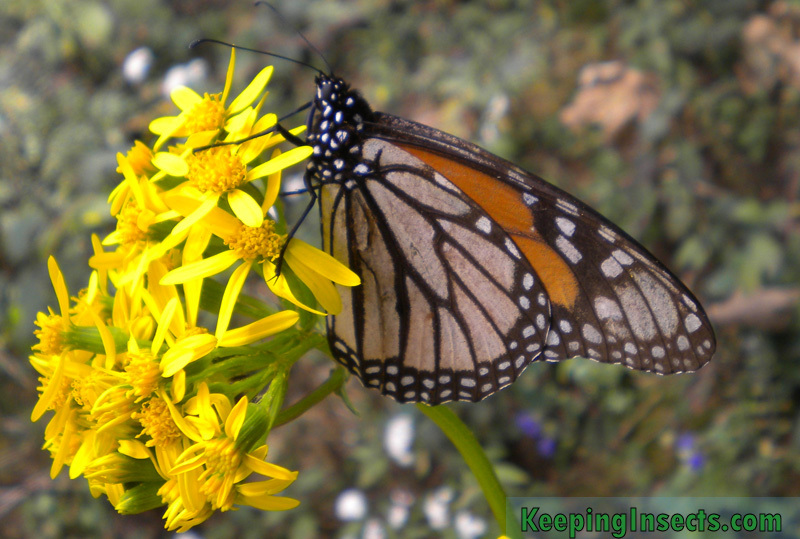 The Monarch Butterfly (Danaus plexippus) is a famous and beautiful American butterfly species. It has orange wings with a black lining and some white spots. The caterpillars eat the leaves of milkweed plants. The adults drink nectar from most kinds of flowers, preferably milkweed. The Monarch Butterfly is most known for its amazing migrating behavior: it flies from the United States and Canada to Mexico, covering a distance of thousands of miles. The migration happens between August and October. Some populations stay in California instead of continuing their flight all the way to Central Mexico. During the migration the butterflies look for flowers to drink nectar from and will roost in huge groups at night. 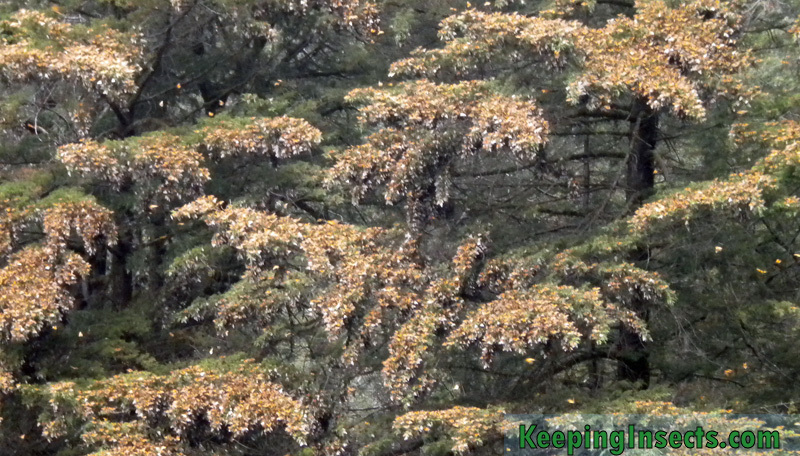 The butterflies can be seen as huge orange clusters on tree branches. When the butterflies arrive in their final destination in Mexico, they stay there in large groups. They roost in huge clusters to keep warm in the cold mountain nights. In the morning they will take flight as soon as the sun has heated up their bodies to a high enough temperature. Millions of butterflies stay together in these roosting areas, flying, mating and roosting for around 5 months. It’s an amazing experience to visit one of the roosting sites of these butterflies. 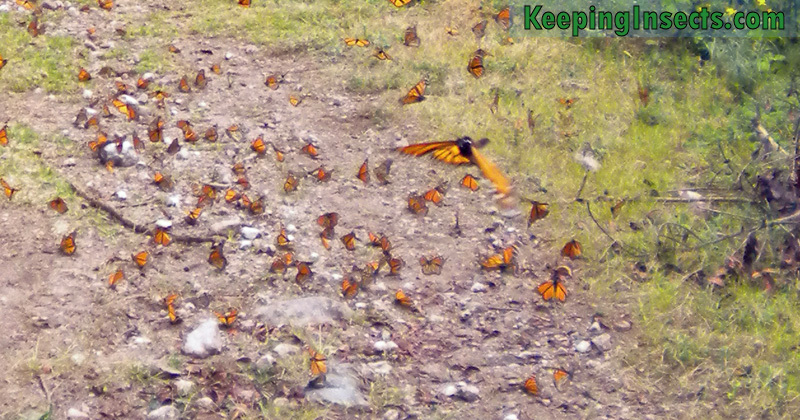 To see millions of bright orange butterflies flying around is a sight you will never forget. Where can you see Monarch butterflies? If you want to see the Monarch butterflies in their overwintering area, you will have to go to Mexico. 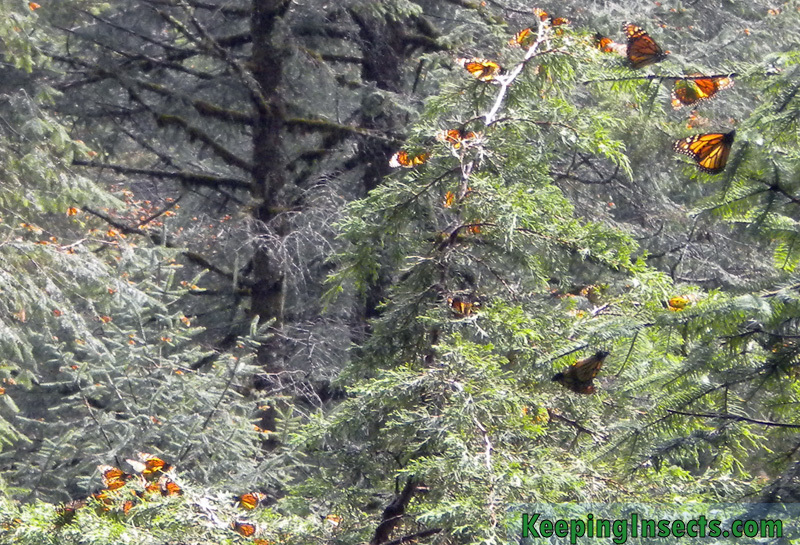 There you will see the largest population of Monarch Butterflies. You can find them there between the middle of October until the middle of March. You can visit the butterflies close to the city Morelia in the state Michoacan. This is approximately a 3 hour drive west from Mexico City. 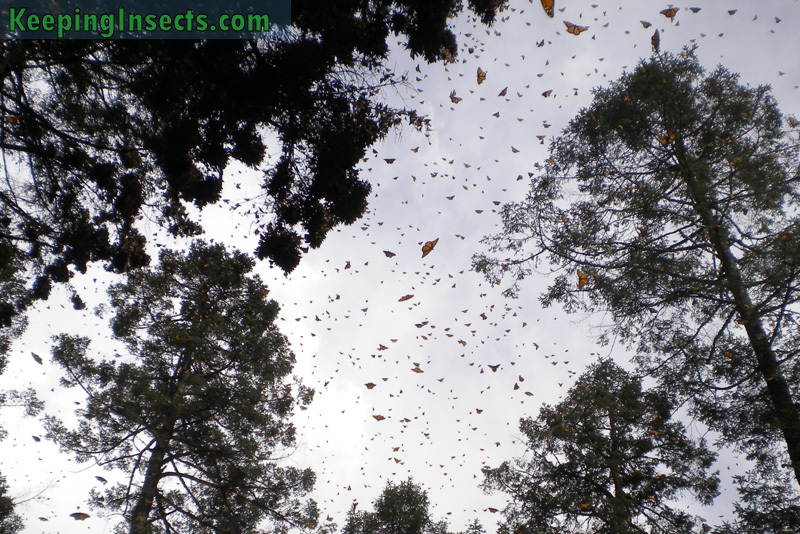 The butterflies stay in trees in the mountains of the Reserva de la Biosfera Mariposa Monarca (Monarch Butterfly Biosphere Reserve). You can chose out of four sites to visit the butterflies: El Rosario, Sierra Chincua, Cerro Pellon and Piedra Herrada. These sites offer a path to the top of the mountain. Touristic services will offer horses to bring you to the top of the mountain if you prefer not to walk. There is no access by cars or other motorized vehicles. The most popular and touristic sites are El Rosario and Sierra Chincua. I went to the Sierra Chincua Butterfly Sanctuary and I was absolutely amazed by the sight of so many butterflies. I went early in the morning in February, when the butterflies were still roosting. After the climb to the top of the mountain it was almost warm enough for the butterflies to be able to fly. I could see all the butterflies hanging in large clusters in the pine trees. At around 12 o’clock the butterflies started to fly. It’s amazing to see, because the cluster of butterflies appears to fall down from the tree, but after a short fall is bursts apart into thousands of fluttering butterflies. They fly all around you, high and low, and you can see traces of the butterflies everywhere.